Diesel is really growing, he is 20 wks old now. He loves it outside especially when he gets to play with his basketball, also loves his tennis balls, sometimes is reluctant to bring them back. (And) Here is a picture of my 16 week old German Shepherd ( Diesel )... He is turning out to be quite a character. He is growing so fast, is 44 lbs already. He loves playing in the snow. Diesel is such a precious & sweet puppy. I imagine he is a great joy to you. Thank you for sharing Diesel with us. 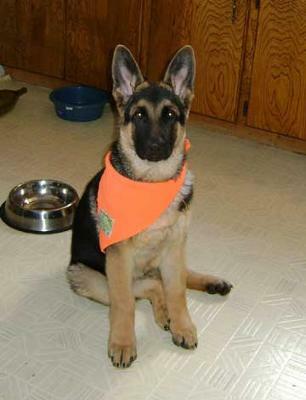 What a Beautiful male GSD puppy!!! Look at those big ears - straight up, I love it. He sounds like my Mia loves her balls, soocer, tennis, softball etc. He is going to be big and powerful. He sounds like a happy puppy and in a loving home. 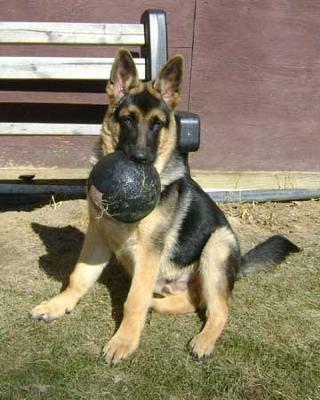 Take care of your boy, Diesel, he will protect you, that's how German Shepherds' are, it's in their blood. He is your Guardian Angel!